Last year, I invited a friend of mine (Jeremy) who is a firefighter/personal trainer to come to the stadium and practice climbing the stairs in order to train for an event he was participating in to raise money for the American Lung Association. Jeremy and his crew are the same ones you see at football games tending to, um, heat exhaustion (because nobody on campus during a football game might be dehydrated for other reasons.) They are also the same department who would show up to rescue us if the building was on fire. This time these guys need YOUR help Spartans! 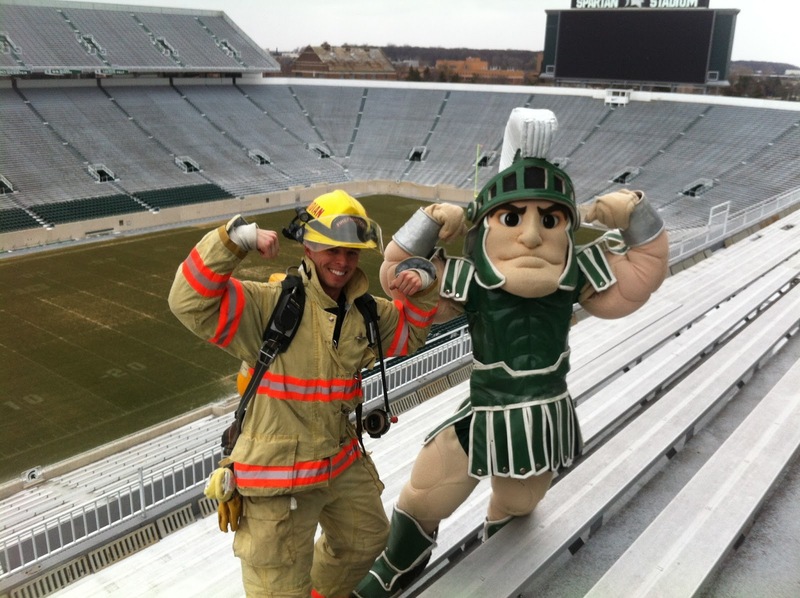 Check out the awesome videos of Sparty climbing the stairs with a few of the firefighters as they trained. Then DONATE to help them raise funds for a worthy cause. Don’t wait to do this! The event is this weekend and every dollar counts.